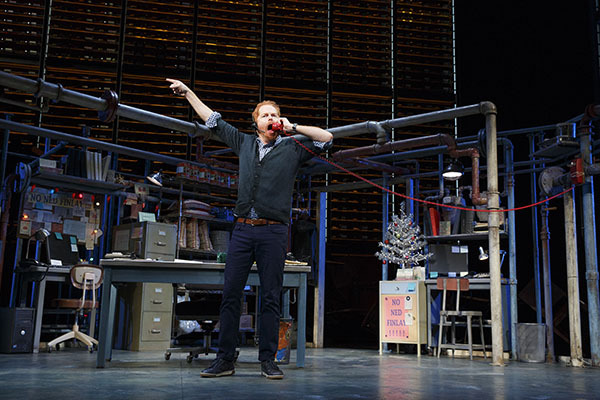 This summer I saw the very talented Jesse Tyler Ferguson star in a hilarious one-man show on Broadway called Fully Committed. Written by my friend Becky Mode (we met in a New Mom’s group back when our now 16-year-olds were newborns), who based it on her experiences working in high profile Manhattan restaurants, it features a cast of some 40 characters that the Modern Family star brings alive via an endless stream of telephone calls to a busy reservation line. Sam is the central character who maintains a patient and positive demeanor as he juggles demands from a range of customers and associates, each one more absurd than the next (per Gwyneth Paltrow’s assistant: all-vegan tasting menu for 12. No fat, no salt, no dairy, no sugar, no legumes, no female wait staff.). Spending about 75% of your time on billable work is considered fully committed. In between dealing with an imposing French maître d, condescending chef, unreliable co-workers, his lonely out-of-town father and his own career struggles as an actor, Sam scrambles to accommodate VIPs thrust upon him, while informing a naïve tourist, inflexible socialite and numerous other quirky would-be guests that the restaurant is “Fully Committed” for the evening. While decidedly less glamorous than a testy Michelin chef and celebrity clientele, I realized several similarities between a booked restaurant and a consultant’s workload nearing capacity. At what point is the independent worker Fully Committed? According to business advisor Charlie Gilkey, the rule of thumb is when you’re devoting about 75% of your available time, energy and attention to billable work and the remaining 25% to marketing, administration and interaction with current and prospective clients. According to Gilkey, this ratio allows you to take on one additional client and stay there, which he says is the ideal position for freelancers in his article, Walking the Tightrope of Being Booked Solid. How can a freelancer get to that point? It’s essentially a two-part exercise in soul-searching, followed by a steely strategy to maintain an optimal workload. 1. Assess whether the client meets your defined criteria. The process starts with clearing out older, less profitable clients who no longer fit your business model or meet your criteria for profitability or industry focus. Or whose demands you deem not worth whatever fees they may provide. · Does this fit your industry niche? · Will it lead to more work that fits your criteria? · Does it meet your requirements for lifestyle and logistics? For example, can the work be done remotely if that is your preference? If you must be onsite at the client’s office, is the commute within a range you deem acceptable? If you need to work around family responsibilities, do the hours fit your available window? · Does the timing work? If you can’t fit it in within your current workload, is there flexibility to push something back? What, if any, adjustments will you have to make on your other work? Your personal obligations? · Does the client pay you on time? · What is the opportunity cost? If this client did not keep you busy, could you be generating higher fees and/or growth with the types of clients who do fit your criteria? 2. Determine if meets your ethereal needs. The second step reflects on factors that are hard to quantify, or, what our coach Ed Gandia describes as more spiritual in nature. Sometimes a particular event triggers action, as content specialist Sarah Greesonbach of Richmond, Virginia discovered. “When a client can't do ANYTHING right (even though they're paying me on time) I know it's time to let them go!” she related. · Do you enjoy working with this client? · Do they appreciate your efforts? Or make continued demands? Rounds and rounds of changes? · How much “maintenance” does the client require? For example, do you need to speak to them numerous times during the week? Process extensive layers of approvals, multiple purchase orders and/or other paperwork? · Are they the type of client that’s good for your soul? 3. Offboard clients who don’t meet your established benchmarks. The next step is thinning out the client roster to include only those who fit the standards you set. Offboarding is a necessary process for any business, according to Mike Michalowicz, author of Profit First: A Simple System To Transform Any Business From A Cash-Eating Monster To A Money-Making Machine. Liz, a freelancer who writes for HR marketers, faced that dilemma recently with two clients that provided steady albeit lower paying work. “I know the time has come to move on. I just can’t seem to take the leap.” Her freelancing peers offered some tips and advice. · Leverage end-of-the year planning discussions. Talking about projects for the next year provides a tactful way to broach the subject and makes a for a graceful exit conversation. Taking advantage of end-of-the year client discussions can ease ill-fitting clients off the roster. Photo by Joan Marcus. “This is a good time to rethink your business because you can make big changes at the end of the year without leaving people in the lurch,“ noted Dana, an Atlanta-based marketing communications expert. Building industry content specialist Tess Whittler has also found the “new year planning” strategy to be a highly productive way to phase out select clients and make room for new ones. · Look beyond the numbers when deciding who and when to cut. Sometimes those more ethereal factors outweigh the more defined ones in your checking account. Once you’re ready to let those clients go, you may find it easier to make the mental commitment to getting new business. For Sarah Greesonbach, the mental stress of yet another assignment from a problem client signaled the turning point to focus efforts on finding new clients. “That makes it feel like a business decision rather than ‘I'm clearly only with them because I haven't replaced them yet,’” she recalled. Dana went through a similar process when assessing her clientele, comprised of professional services firms. “It was stressful but necessary. I ended up dropping a large corporate client that represented almost half my income (but ironically my lowest hourly rate),” she said, as well as a smaller client. “I haven't looked back. I won two new small clients in the past month,” she noted. · Check the fit before you commit. The easiest way to avoid the off-boarding conversation is to avoid onboarding ill-fitting clients. Such scrutiny paid off for Mary. “Years ago I was considering a horrible assignment. I would have to be onsite every afternoon (software thing, could access it only at client site) and they would pay half my rate. I was considering it because I was scared,” she admitted. After a bit of soul-searching and chatting with a saleswoman friend who pointed out the many good hours that would be burned up by the commute, she decided against it. “She was right,” recalled Mary. “And about two days later I landed a huge corporate project, mostly working from my home office. That was a high-profile project and it helped me to land other big corporate projects.” Had she accepted the onsite job, chances are she would have had to pass on what turned out to be an extraordinary opportunity with long-term dividends. · Just say no. That’s right. Two words. Think about the opportunity cost. · Delay the start date. The client may be willing to wait until you are free. · Provide options with price tags. When a few hours of consulting expanded into something much bigger and the client requested extra work on a low budget and short deadline, David, a freelance writer, knew he had to take action. As the scope of his original project was creeping, he had taken on a new client at half-time, additional work with a reliable existing client and developed several solid prospects at his full rate. · Hire some help. Outsourcing professional and/or support work can get you through a busy time in the short term without having to decline a well-suited assignment, or help you scale your business in the long term. “If they are a good client I will refer them to someone else I know (usually a freelancer who is just getting started who has the bandwidth),” shared Laura Pennington, of Letter of the Law, who does content marketing for attorneys out of North Carolina. Ed Gandia, a big proponent of delegating select work as part of a growth strategy, suggests starting small with one client and a minor assignment. Finding skilled and reliable talent is expedited if you have a strong community to turn to. The Freelancers Union facilitates connecting with experts and collaborators with its extensive resources and membership. Members of our private Facebook group have taken on each other’s overflow with great success. If like me, you work in a co-working space, you might find a project partner via your community board or café (I have found both at Brooklyn Creative League). Subcontracting other lower level tasks allows you to focus on the higher level work that demands your particular expertise. Virtual assistants, researchers, proofreaders and copy editors can free up precious hours. I personally have found it extremely worthwhile and efficient to have my phone interviews transcribed by a professional service. (I love Rev and its 24 hour turnaround.). Technology can also absorb some of the tedious, labor intensive, repetitive or highly detailed tasks, as users of calendar scheduling (Calendly), bookkeeping (FreshBooks), document-sharing (Google Drive) and CRM customer software (Contactually) can attest to. Technology can be a time-saver, allowing you to focus on client work. · Amend your standard terms. Consider save-the-date clauses, rush rates, time-limited estimates and policies that say that new contract terms come into effect after a designated time between projects. · Raise your rates. You heard me. Take a cue from Laura Pennington and use a straightforward approach as your plate becomes full. “When this happens to me, I either mention that I'll be raising my prices or that my business model has changed such that I can no longer accommodate orders of less than $x monthly,” she related. A more spiritual perspective might achieve a similar result, suggests Jean, a Maine-based public relations and communications consultant. Unless you’re as smooth as Sam the restaurant reservationist, it’s advisable to have a contingency plan – even if it’s a loose one – in place before you get to capacity. If you’re not, you can follow the roadmap as outlined. You’ll be best served by establishing your personal criteria and continually assessing how clients and projects fit it while building an arsenal of strategies to eliminate ill-fitting clients, allowing you to reach that delicious state of equilibrium called Fully Committed. Are you there yet? I'd love to hear how you did it. Untethered is a curated collection of news, trends and thoughts about remote working enabled by technology by Carolyn Cirillo, an LA-born, Brooklyn-based design writer, researcher and marketing strategist.